Remove excess coating from gun. 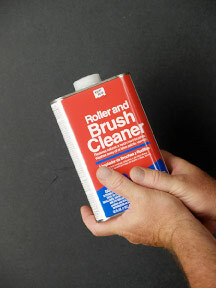 Fill a cup with 1/2” of lacquer thinner or Roller and Brush Cleaner. Swirl cleaning fluid around inside of cup several times. Spray into disposable rags for 20 seconds. Ventilate and dispose of the rags immediately. Warning: Do not leave rags piled up due to the danger of spontaneous combustion.